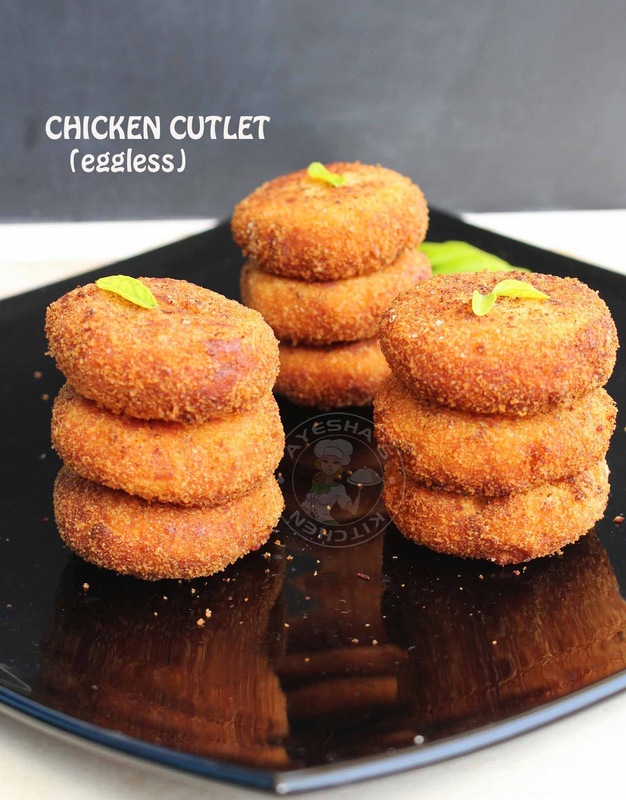 Cutlets are the yummy popular spicy snack which has a crispy coating with softness inside. You can make different varieties of cutlets like chicken cutlets, beef cutlets, veg cutlet, potato cutlet, mutton cutlet, fish cutlet etc. Each cutlets are unique in taste and flavor. Moreover you can also make sweet cutlets with ripe plantains, dates and plantain, vermicelli etc. Few days back i have shared a banana cutlet recipe in my blog. You can also shape cutlets according to your preference. Some makes heart shaped cutlets while some make round flatten cutlets like so. 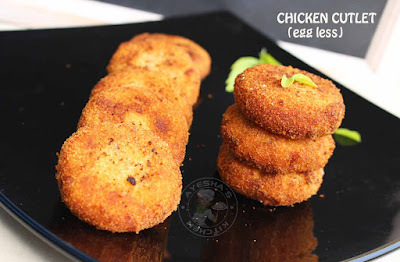 Here i am going to share a chicken cutlet recipe without using egg. Egg is used in cutlets as a binding ingredient. So instead of egg i prefer using gram flour mixture which also act as a strong covering for cutlets. During Ramadan, people love to make different snacks recipes for iftar. Samosa and cutlets are considered as the most common snacks recipes for iftar. 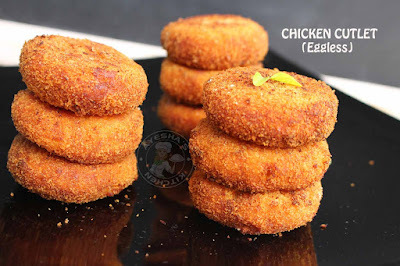 So here is the recipe showing how to make chicken cutlet recipe / egg less recipe / chicken snack/ spicy snacks / ramadan recipes for iftar. Making of shredded chicken - cook chicken pieces along with chili powder, pepper powder, garam masala powder, and salt (chicken breast more preferred ). When done, shred it using a grinder. Set aside. Making of mashed potato - Add potatoes with required water and salt in a cooker. Pressure cook it for 2 whistles. Drain the water, peel the skin and mash them well. Set aside. For the filling - Heat oil in a wok. Saute onion, ginger garlic, green chili paste. When onion turns translucent, add garam masala powder. Mix well. Then add, shredded chicken. Mix well. Add soy sauce, chili powder and chicken cube to it. Combine very well. Now add, mashed potato. Mix it. Let it cook for a couple of minutes. Check for salt. Set aside to cool. For the gram flour mixture - Combine gram flour or besan with water to make a watery batter. (You can use egg instead of this mixture. But i prefer eggless cutlets ). Add a pinch of salt and mix well. Set aside ready. Shaping cutlets - Now make a medium sized balls out of this potato chicken mixture. Slightly flatten on the top. Dip in gram flour mixture and coat with bread crumbs. Serve it along with ketchup or green chutney.